I am making this post to show you my before and after pictures from my transplant which was probably the best decision I have made in my adult life. I am very happy and actually have people complimenting on my hairline now. My hairline before had receeded significantly but now I am back to where I was when I was in high school. Attached are some before and after pictures. I will be posting up some more new pictures soon! Looks nice. Who performed your surgery, when, how many grafts and in which areas? Also, do you remember which Armani techs did your surgery and was this in Toronto? Thank You Peter! Dr. Armani performed my surgery back on march 31 2008 in LA. I do not remember the names of the techs sorry but i can try and find out for u. » » this in Toronto? How many grafts did you get? Can you post a before picture where the hair is combed forward like in the after pictures. You have to compare apples to apples. » » » this in Toronto? » » out for u. » How many grafts did you get? » after pictures. You have to compare apples to apples. 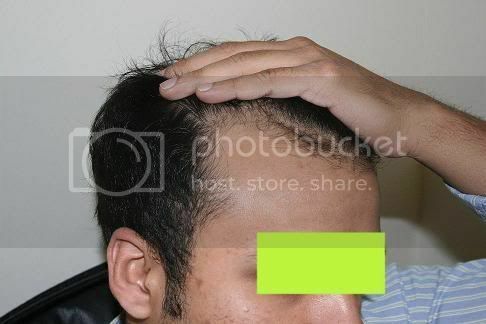 I got 3500 grafts in my temples and in the center of my head in the front cause hair was thinning there as well. I did not comb my hair forward, the temples and hair on the temples was where my hair sits now. I am adding another shaved picture from before the surgery. No I am talking about your before pic where you are pulling your hair back with your hand. You can’t compare a picture where you are pulling your hair back with your hand to a picture where you are not. Leonardo obviously you can tell even if he pulled his post op hair back you can tell it’s not going anywhere. He pulled his hair back in the first pic to show the M-Shape of his hairline. Great result…looks like your grafts took well. You had quite a lot of recession…makes a huge difference. Was it FUE…how was your healing time? I like what you said about it feels good to be back to where you were in high school. I know exactly what you mean. My procedure was in September '08 with Armani. Over the past few years my thinning hair was bothering me. Now that my hair is coming back the feeling can’t be compared to anything. Your pictures are looking fantastic. Best of luck. It looks very dense & the hairline (as allways with the Armani clinic) looks amazing. I hope you are enjoying your new life with great hair! » anything. Your pictures are looking fantastic. Best of luck. Thanks everyone for your compliments, I will take the time out to take some more pictures, I recently buzzed my hair a few months ago, In a few weeks time, it will be long enough to take more pictures. gone786, thats a real nice transformation. I think you look much better with your new hairline. » pic to show the M-Shape of his hairline. You can’t tell anything. What if he pulled his hair back post transplant? Would that look like an M shape too? What if he didn’t pull his hair back in the pre op? Would that even look M shaped or would it be the same shape? We can’t tell because it’s not laying naturally. Hey man thanks for this update and for posting that pre-op shaved pic. It really lets us see the extent of your thinning and how much work was needed to sort it. You’re looking good now with your youthful hairline! I bet you’re really happy!! The results look good. The hairline looks suited to your face shape. Just be glad your hair loss is only as bad as it is. When I was in high school, I already had your receded hairline in the “before” pics. Thanks for sharing your pics. Dr, Armani did a great job and your results look so natural. I will be going out to LA in March for a FUE procedure with Dr. Armani. I look forward to seeing some more photos once your hair has grown out some more. Very nice result, how much donor do you have left in the bank? Impressive, you must be a very happy man! Any directly post-op pictures?